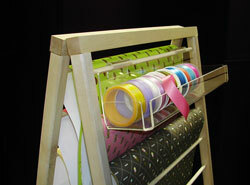 For flat gift wrap, newspapers, scarves, shawls, and linens, this wood display is the perfect solution. 20 wood dowels provide 25" wide space for display. Wood is solid maple with a waxed finish for strength and durability. Height is 60".